You can use your Suunto Ambit3 Peak for recording swimming exercises in a pool or openwater. When used together with the Suunto Smart Sensor, you can also record your heart rate while you are swimming. The heart rate data is automatically uploaded to your Suunto Ambit3 Peak once you get out of the water. When using the pool swimming sport mode, Suunto Ambit3 Peak measures your swimming speed based on the pool length. Each pool length creates a lap that is shown in Movescount as part of the log. Select the pool length. You can select the pool length from the predefined values, or select the custom option to specify the pool length. Scroll the values with Start Stop and Light Lock and accept with Next. Press Start Stop to start recording your swimming. 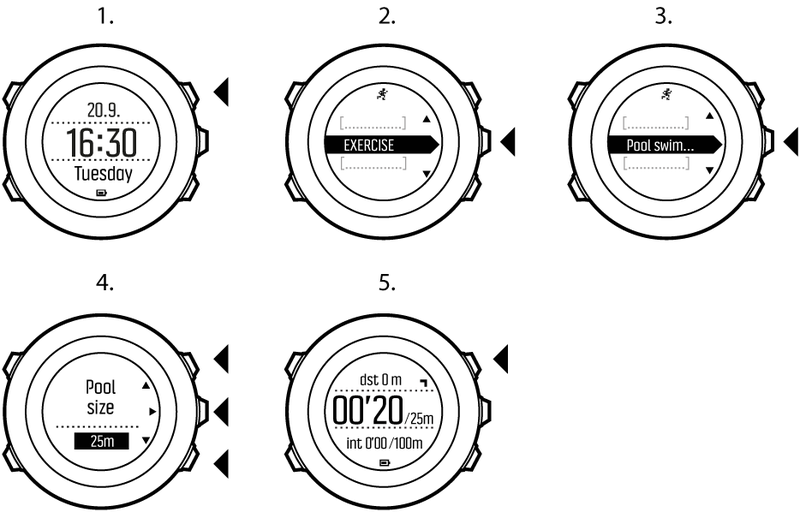 You can teach your Suunto Ambit3 Peak to recognize your swimming style. After teaching the swimming styles, Suunto Ambit3 Peak detects them automatically when you start swimming. While you are in the Pool swimming sport mode, keep Next pressed to enter the options menu. Press Next to select Swimming. Press Next to select Teach swim style. After you have finished swimming, press Start Stop to save the style. If you do not want to save the style, press Light Lock to return to the swimming style selection. You can exit teaching swimming styles any time by keeping Next pressed. In the Pool swimming mode, keep Next pressed to enter the options menu. Scroll to Reset taught styles with Start Stop and select with Next. You can do swimming drills any time during your swimming workout. 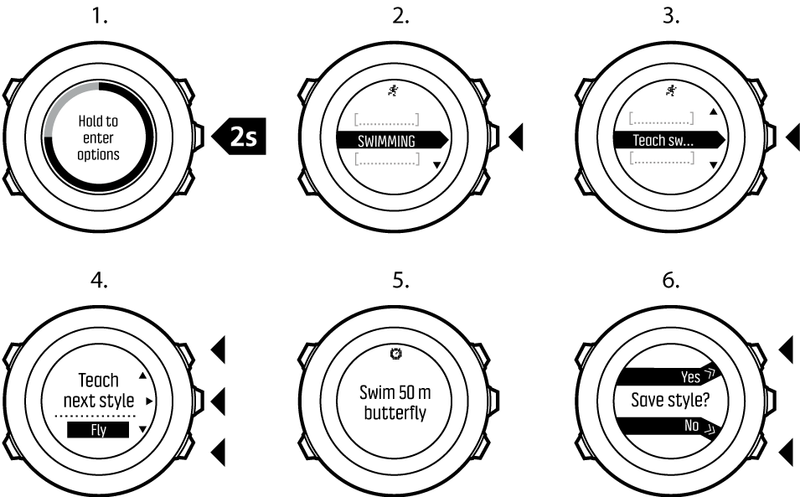 If you do a drill with a swimming style that the watch does not detect as swimming (for example, using only your legs), you can add the pool length manually for each drill to keep your total distance correct. Do not add the drill distance until you have finished your drill. While you are recording your pool swimming, keep Next pressed to access the options menu. Press Next to enter Swimming. Press Next to select Drill and start swimming your drill. After you have finished your drill, press View to adjust the total distance, if necessary. To end the drill, go back to Swimming in the options menu and select End drill. When using the openwater swimming mode, Suunto Ambit3 Peak measures your swimming speed using GPS and shows you real-time data during the swim. 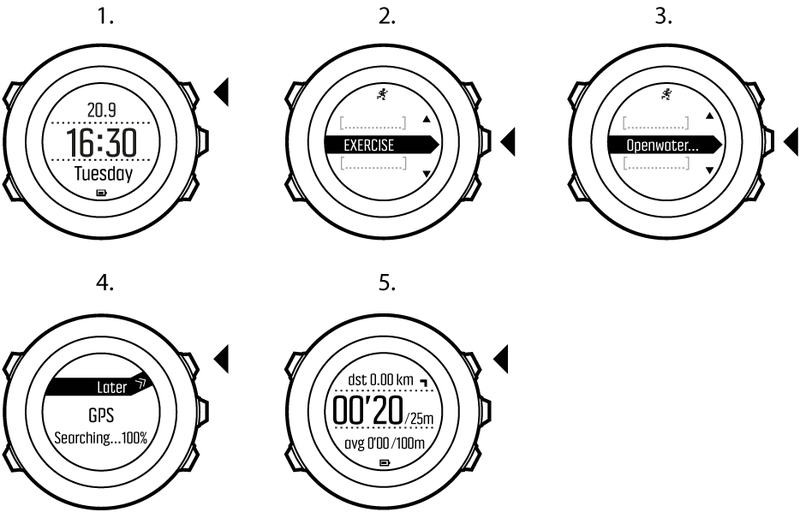 Scroll to Openwater swim with Light Lock and select with Next. Wait for the watch to notify that a GPS signal has been found. Press Back Lap to add laps manually during the swim.